A love for festive and memorable occasions has lead to design partnerships with those in the industry who feel likewise. Collaborations challenge us to push the envelope and discover novel ways of translating our aesthetic and approach into new realms of creative correspondence. An exciting facet of our studio, here you can learn more about the creative engagements and partnerships that keep us inspired. Partnering up with Artifact Uprising, we designed an exclusive botanical wedding suite for modern romantics. Well-known for their signature photo books, Artifact Uprising has long valued quality materials and thoughtful design, a recipe evident in all of their offerings. Their minimal and refined aesthetic imbues a sense of intention and effortlessness into all of their pieces, placing each couple’s unique story and message in the foreground. Our mutual appreciation for smart, simple, and modern design made for a natural union, a collaboration yielding some delightful fruits (and flowers). When developing their first full collection of Wedding Card Suites, the design team at Artifact Uprising was looking to introduce a floral element as something quite new and different within their line of minimalist invitations. Working together to create a suite based on a botanical style, the suite includes save the dates, invitations, reply cards, enclosure card, thank you cards, and corresponding envelopes for all pieces. The versatile aesthetic is designed to translate across a variety of wedding themes and seasons, offering the contemporary couple a touch of playful and modern botanicals into their wedding correspondence. For the collaboration, we combined our unique artistic approach to floral illustration with Artifact Uprising’s minimalist design aesthetic, the floral elements lending an lush layer of intricate detail to the designs. The floral illustrations are crafted through a unique method of photographic collage, a process that results in playful and slightly surreal compositions with an unexpected quality. The crisp and vibrant appearance of these illustrative blooms feel quite different from other painterly styles, with an expressive visual effect that is distinctly modern, whimsical, and romantic. In approaching the design of the typographic elements of each printed piece, we aimed to keep thing clean and modern, in alignment with Artifact Uprising’s signature design style. We worked with chic and timeless typefaces that posses nuanced character, and formulated the designs around considered, hierarchical, compositions of the text. Corresponding envelopes for the suite feature whimsical shapes and sophisticated hues. There’s even an option to add gold foil to accents within the botanical illustrations, for the opportunity to further elevate the suite and add an additional moment of shine. As the go-to source for festive digital correspondence, we were thrilled to collaborate with Paperless Post on a series of announcements and invitations across a variety of occasions. This unique partnership challenged us to translate our design aesthetic - one traditionally only realized through tactile materials and methods - to announcements and invitations that would occupy a digital space exclusively. 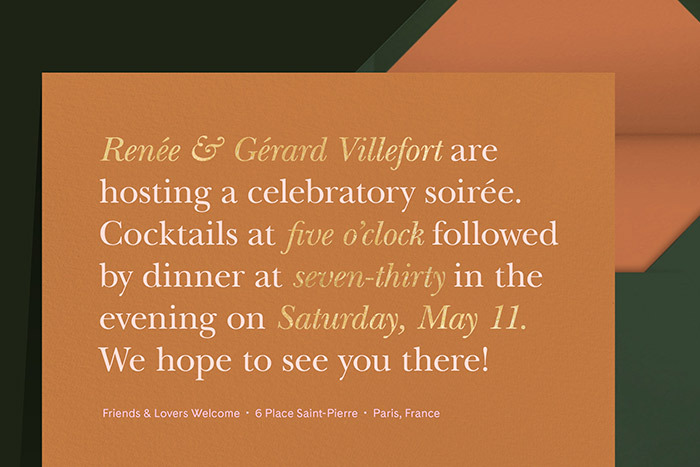 The collaboration allowed us to indulge in our love for digital design, and embrace the effortlessness and accessibility that comes with sharing the news of your latest soirée via the convenience of your inbox. Take a look! This design partnership was an exciting opportunity for us to branch out beyond wedding cards and into all kinds of festivities including baby showers, cocktail parties, rehearsal dinners, etc. 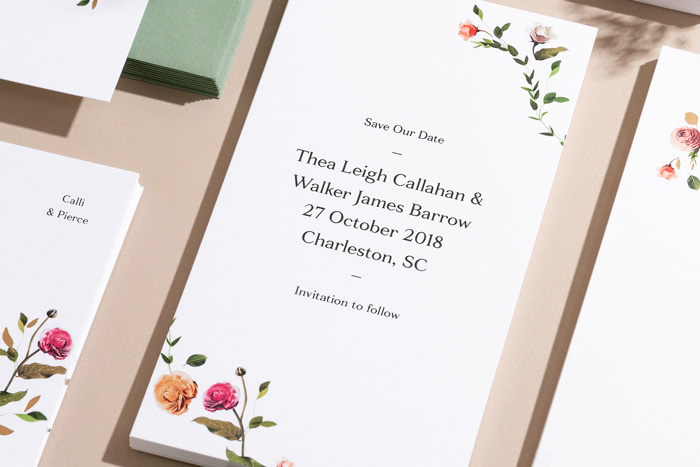 While going all-digital is a seamless and fantastic option, we also imagined that these designs could work for the couple that chooses to go with printed invitations but would like to save on invites for all of the events peripheral to a wedding such as rehearsal dinners, post-wedding brunches, welcome cocktails, etc. With a luxe printed suite, multiple RSVP cards (based on varying guest lists) can get costly, so we think these digital options will suit those event perfectly and allow for a seamless sense of design across all modes of correspondence. For our collaboration, we wanted to capture a color story that reflected the Venamour color sensibility. Thinking about color is a big part of our process when working with printed materials, and it’s always a consideration when designing for weddings and events. Our collaboration uses colors that are not tied to a particular season, but that evoke a kind of sensory memory - ochre, peach, sage, and terracotta all come into play in this new line of digital work. We’ve taken the most sought-after hues from our bespoke suites, and it’s exciting to see them manifest in a digital space. True to the spirit of the Venamour brand, we brought botanical moments and a bold typographic aesthetic to this collaboration. With a passion for type design, we wanted the Paperless Post designs to utilize this confident and playful approach. To us, it’s a combination of minimalism and maximalism - considered typeface selections combined with careful typographic arrangements create the a feeling that some describe as minimal, but when combined with dramatic fonts and wild colors, we think there’s an unabashed confidence and festivity that reigns throughout. We love the clarity of these designs, evoking the chic look and feel of an exclusive invite to a clandestine fashion week presentation as opposed to traditional wedding papers.